Do you hear people mispronouncing words everywhere you go, and does it make you cringe? This post stems from many years of frustration, listening to people mispronounce words all of the time! I can’t stand it and it drives me crazy, so I have put together an entertaining video for you. First off, I am not here to criticize people whose native language is not English. I commend you all on trying to learn it. This post is also not referring to how people speak in England or other countries, but is about how to speak American English. This post is for all of you people who were born in the United States of America and attended at least elementary school. Come on, if you paid any attention in school and passed the 3rd grade, you should know how to say these words. Yet, I hear people sounding as dumb as they can on a daily basis. I am not an English major, and you don’t have to be to learn and speak correctly. I don’t care what state you grew up in, the correct pronunciation of words does not change based upon that or any accent you choose to have. There is a correct way to say a word and don’t let your southern, eastern or mid-western grandma tell you differently or you will sound as ignorant as she does! If you want to sound like an educated, intelligent person, don’t copy the way you hear other people speak. You can google any word and hear the correct pronunciation of it, so this post is not based on my opinion of how you should speak, but is based on the correct pronunciation of the word by three English dictionaries. Check it out for yourself. Some words are tricky and don’t always make sense when you look a them but for the most part, if you take a moment to look at the placement of letters in a word, you can most often sound it out. Stop being so lazy and READ! This word is often mispronounced as SHERBERT. Stop adding letters that aren’t there! If you are placing a BET, do you call that a BERT? No! It is a bet, same as the end of the word SHERBET. Got it? I hear people call it CHIPOLTE (CHIP OL TAY) or (CHIPOLTEE. The L is after the T, not before it, therefore it ends in the LEY sound, but not TAY. Again, just look at where the letters are placed. Are you intrigued? Do you want to learn more? 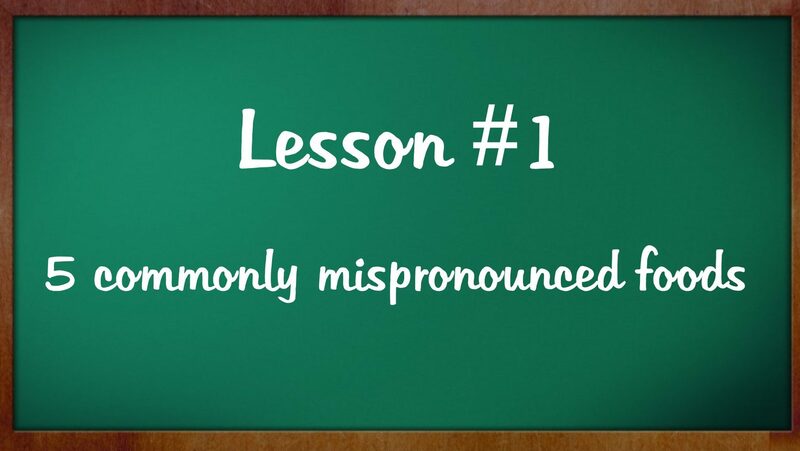 For further explanation of these and many other mispronounced words, feel free to watch my videos, starting with Lesson 1 below. You may find them frustrating, entertaining, irritating or stellar. Either way, you will be educated. Woohoo! Spread the knowledge!